Trailhead: MM 27 Buckhorn Draw Rd. 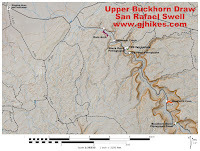 The TKG Petroglyph site is located in Buckhorn Draw within the San Rafael Swell between Green River and Emery, Utah. The site gets its name from the initials T-K-G that were riddled into the cliff next to the petroglyphs with a gun. 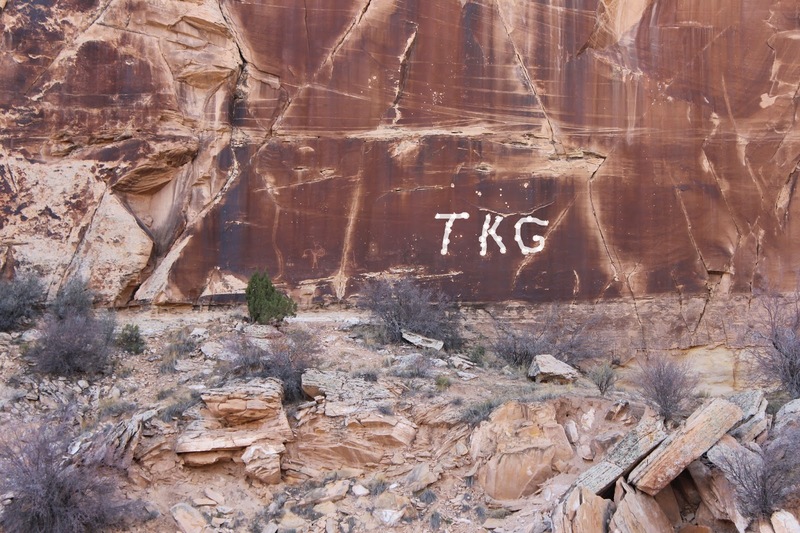 The TKG site is directly across the road from the Black Rock petroglyphs. The TKG petroglyphs are 27 miles north from Exit 131 of Interstate 70 along the Buckhorn Draw Road. Exit 131 is about 30 miles west of Green River, Utah. After pulling off the road there is plenty of room to park around a primitive camping area. The petroglyphs are across the wash. We highlighted the initials on the computer to make them stand out but they can still be seen from the Buckhorn Draw Road if you know where to look. 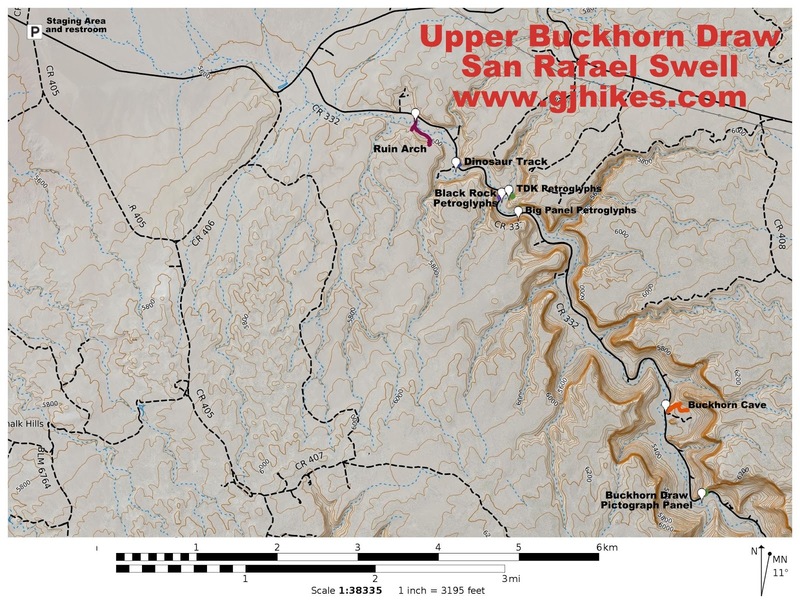 At present there isn't a developed trail across the wash but it is easy enough to hike. There are only a couple of petroglyphs at this site but they are very intriguing. The most prominent figure is the bird man. It has a human arm on one side and a wing on the other that encompasses a concentric circle figure. It also has one human foot and one bird foot. This is another interesting petroglyph that may represent someone killed by a scorpion. Generally an upside down figure represents death or a dead person. The other image to which it is connected looks like a scorpion and since they are connected we suppose that one effected the other. Buckhorn Draw has rock art dating back thousands of years. Many others have left their mark in the area as well including an inscription left by the outlaw Matt Warner. The Old Spanish Trail also went through this area so there are bound to be traces from that period. Herds of wild burros that were strays from that time period can still be spotted in places. See our post for Dutchmens Arch for pictures of wild burros and where they can be spotted. It would be interesting to read any old journals that might be extant from travelers on the Old Spanish Trail to see if they had anything to say about this area. Perhaps whether they encountered any Indians or commented on the rock art. If you would like to see it for yourself then all you have to do is 'Take a hike'.